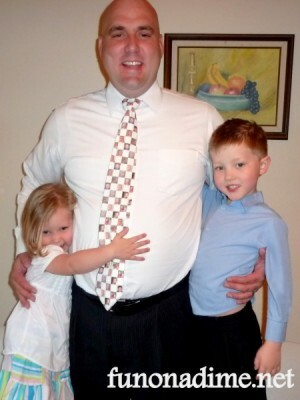 You are here: Home / DIY / Birthdays/Celebrations / Father’s Day Tie – One Tie He Will Not Throw Away! Do you want to know what my husband is getting for Father’s Day? He has already made a request, so it is an easy one for me this year on figuring out what to get him. Normally, I like the kids to do their own Father’s Day Gifts without much help from Mom, but I cannot deny this request! He wants an updated Father’s Day Tie! White Tie – The copy center had one, but it was just a bit short for my tall husband. I am on the lookout for a white tie. UPDATE: there are a TON of white ties that would be perfect on Amazon. Click here to go look at them. Step 2: Open Word or other software that you are comfortable with and insert each picture into the document. Step 3: Crop each picture to make it a square. Then right click on each picture and click on “size” to resize it to your desired height/width. I made all my picture 1 inch by 1 inch for this demo. Sorry, I used sample pictures from the computer for this. Step 4: If you want to do the checkerboard pattern like my tie,you can do it two different ways it just depends on which sounds easier. You can either make a table with as many 1inch columns (or desired size) across and enough to go the length of the page. OR, the way I prefer, you can edit your picture to “through” (see above picture – right click, then click on “text wrapping”, then “through”). Then insert a “Shape” (double click on the shape to make it 1 inch by 1 inch width and height or desired height/width), also make that “through” and use that for your layout. Step 5: Make sure your rulers are on and then stagger your first line with one picture, one blank square (or empty column depending on which way you are doing it) , one picture, square, etc. For the second line, Add the square (or blank column) first, then picture, square, picture, etc. Now you have your layout. Step 6: Continue this process until you have one full page. Try to mix up your pictures so that the same pictures are not in the middle each time. Once you do the first row of blank squares, you do not need to add them for spacing. Make sure you erase the squares (or remove the borders) before you print. Step 7: Print two pages off and take it to the copy center with your tie, if they don’t carry any. Call ahead and make sure you have a place that will do it. Explain to them what you are doing and hopefully they will take it from there. You may or may not need to tape the two sheets together end to end depending on the place, so you have no gaps in the flow of the pictures. The reason I create two full pages of pictures is so that when the copiers copy the photos to the tie, it does not matter if they are exactly in the middle or on the side of the sheets as long as the tie is getting covered. Step 8: Also, make sure that you copy/instruct the copiers to copy the pictures on to the tie up past the point of where the wearer ties his knot. I only did mine half way up since they back side is never seen and does not need to have any pics on it. My hubby is tall he so he had to fake it to make it work. This next time I am getting him a longer tie and measuring to see how long he needs it so the pictures are continuously through the front and knot of the tie. Step 9: Get creative and enjoy your genius-ness! Here are some other alternatives. You can do stripes, diagonals, tint everything one color, change the size and have tiny stripes or diagonals…the sky is the limit! Then again you might decide you want something faster/easier, in which case, check out Zazzle’s photo ties. Oh my, you are clever!!! How fun! Thank you for linking to Kids Get Crafty – fabulous to see you there again! wow!!! This is awesome, I will be featuring you on Sunday! That is ‘sew’ awesome!!!!! I love this gift idea! Visiting from Sugar Bee’s Take a Look Tuesday. How cute and fun is this! Oh my gosh! What a great Idea! I found your blog through a link party and I LOVE it! I love making new blog friends! I am your newest follower and would love it if you would check out my blog and follow me too! Thanks!